Is it cold this week in your corner of the world? 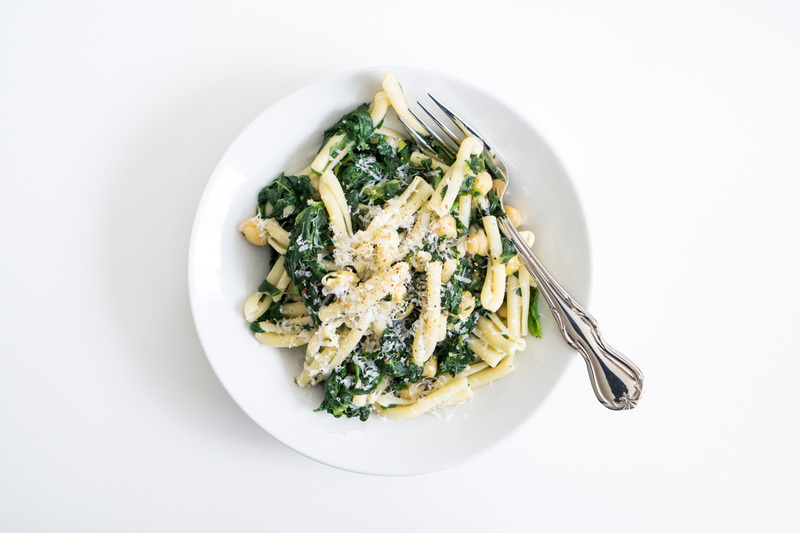 If so, you should make this intensely satisfying pasta dish that tastes so light and fresh, you’ll be reminded that spring is coming soon. In college, I spent a very snowy and cold semester interning in Washington, DC. Our corner of the capital was filled with plenty of beer, bar food, and steakhouses, but not many cheap options for students. Even the supermarkets were expensive: the only Safeway within walking distance featured one-third of the offerings of California grocery stores, and, to add insult to injury, higher prices. I had to learn to shop on sale in order to maximize my dollars. Meat was not an option for penny-pinching me, especially not with the possibility of cross-contamination in the cramped apartment kitchen and refrigerator that I shared with three other girls. My option was to cook vegetable meals–and in an era when the Internet was not swimming with as many good recipes as it is today, I was limited to the one cookbook I brought with me to DC: John Thorne and Matt Lewis Thorne‘s thoughtful collection of food essays, Pot on the Fire. Even in the dead of winter, I could always find some vegetable on sale around which I could structure my meal. Some weeks it would be asparagus. Other weeks, bell peppers. And sometimes, I would find reasonably-priced bunches of spinach stacked on top of each other in the vegetable displays. 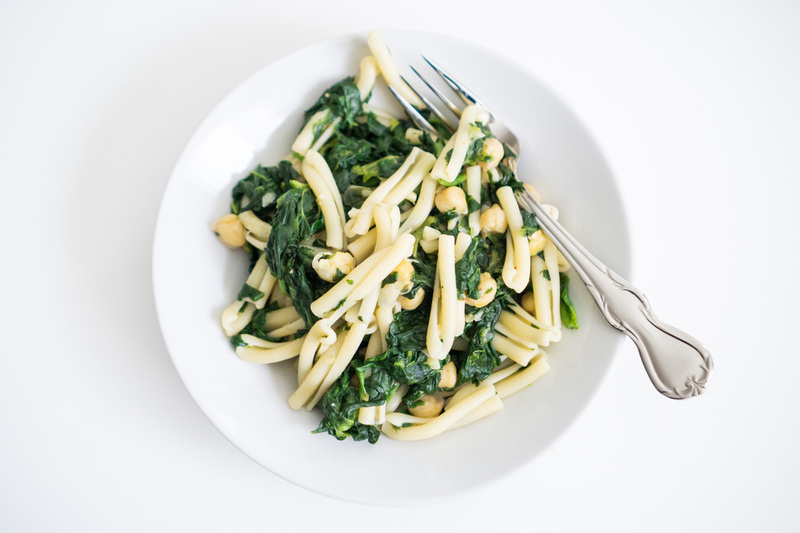 With this bunched spinach, I would often make John Thorne’s recipe for Spinach and Chickpeas with Fusilli (which is itself based on a recipe from Lynda Brown’s The Cook’s Garden). Spinach by the bunch, with its leaves of varying size and shape, long stems, and seemingly endless amounts of sand, looks a world apart from bagged baby spinach leaves. 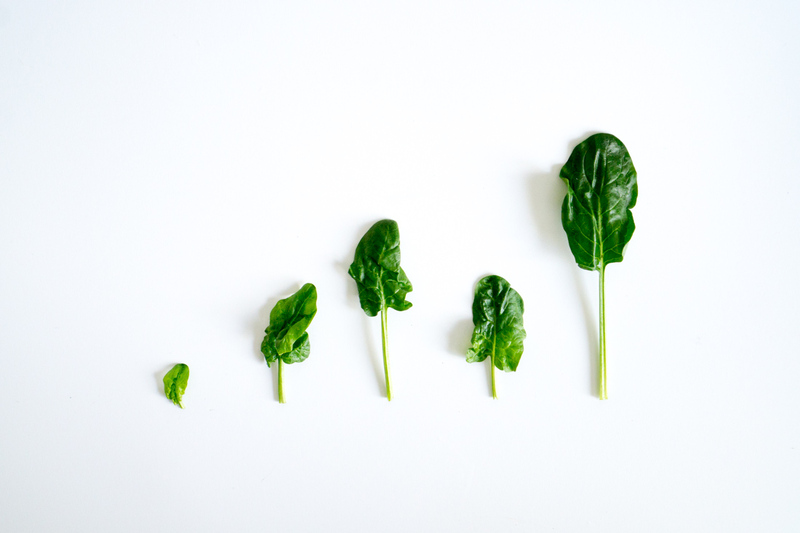 While tender baby spinach leaves are great in salads, they’re not so great when cooked–baby spinach quickly collapses into a slippery mush, and it doesn’t taste quite as “spinachy” as bunched spinach. About six to eight hours before you want to cook dinner, rinse and soak your dried chickpeas with salt in about three times the volume of room-temperature water. Alternatively, if you’re like me and you frequently don’t think about making a recipe until the day of, you can do a quick soak: bring the beans to a rolling boil for 2-3 minutes, cover, and let sit for 1 hour before proceeding with the cooking of the chickpeas. After the chickpeas take their hour-long bath, uncover and drain the chickpeas and return them to the pot with two more cups of water. Simmer the chickpeas, uncovered, until they are tender, which will take about 1.5-2 hours. 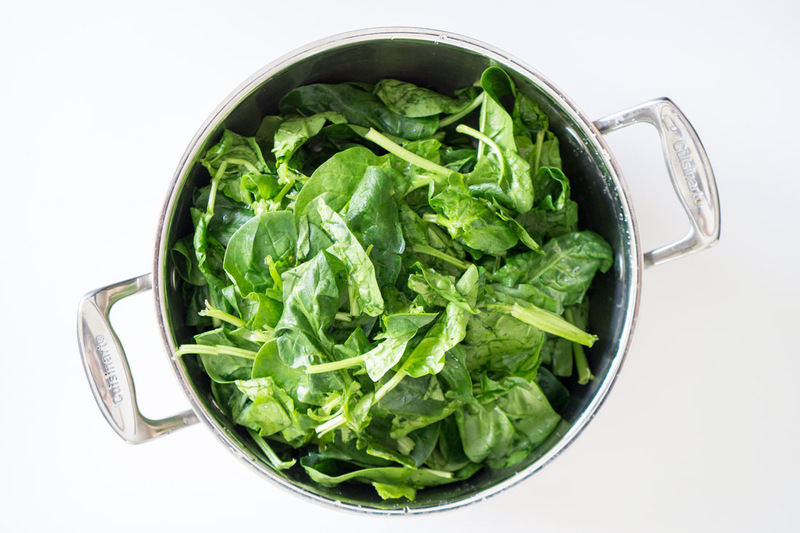 In the meantime, prep the spinach by picking out damaged leaves and washing the spinach in three changes of water. Wilt the dripping-wet spinach in a large pot over high heat. 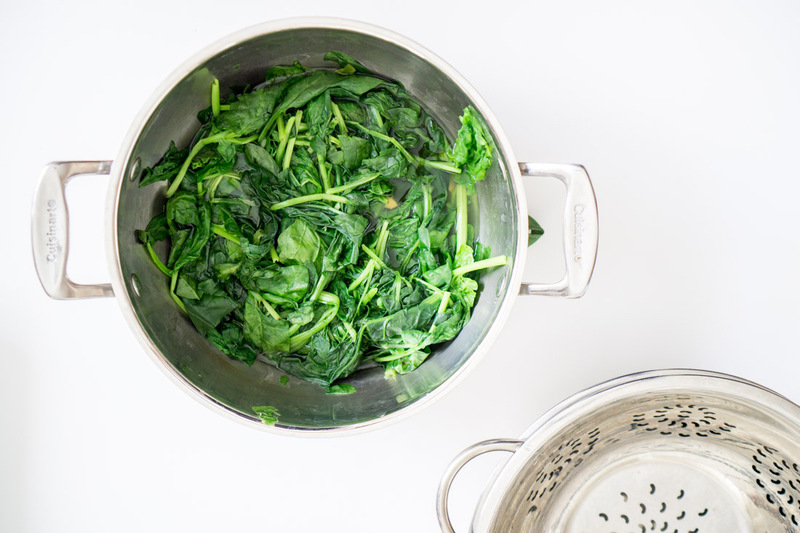 Transfer the wilted spinach to a colander set over a bowl, and with a spoon, press out the spinach liquid into the bowl. 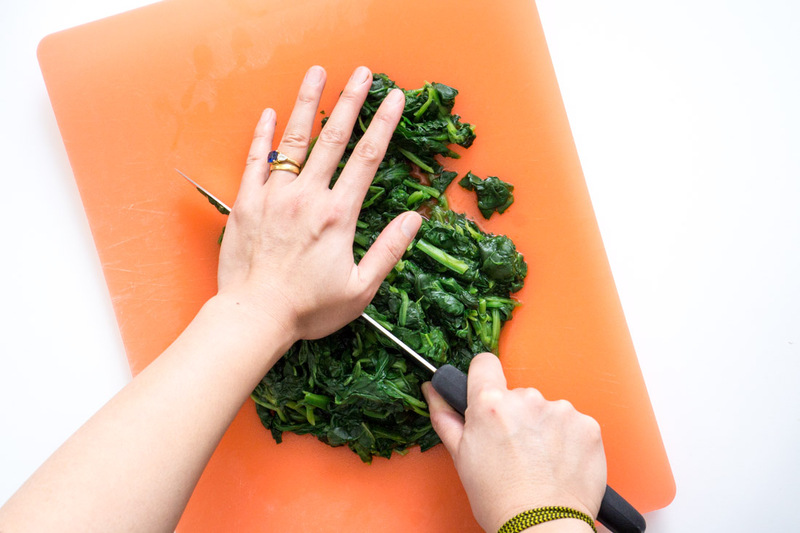 When the spinach is cool enough to handle, dump it out onto a cutting board and coarsely chop it. Set it aside. 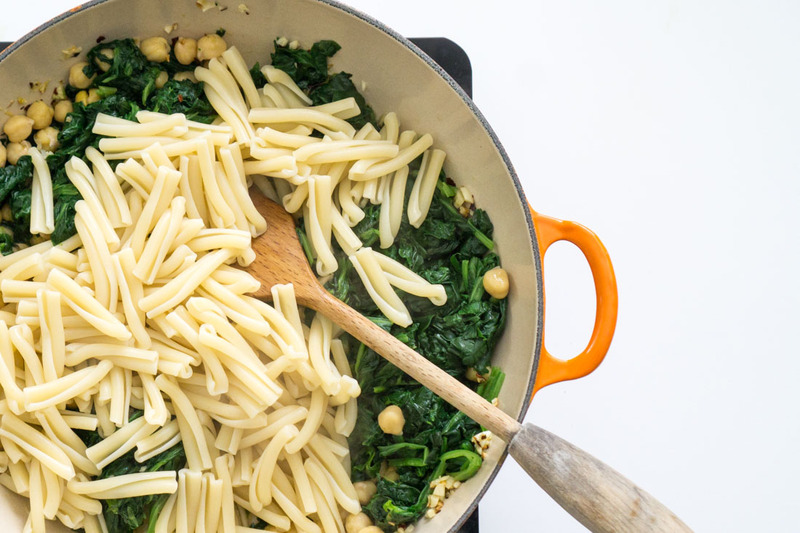 Boil your pasta, sauté the spinach with red pepper flakes, minced garlic, chickpeas, and some chickpea cooking liquid, season with salt and pepper, and then mix everything together until it’s a happy marriage of pasta-chickpeas-spinach. 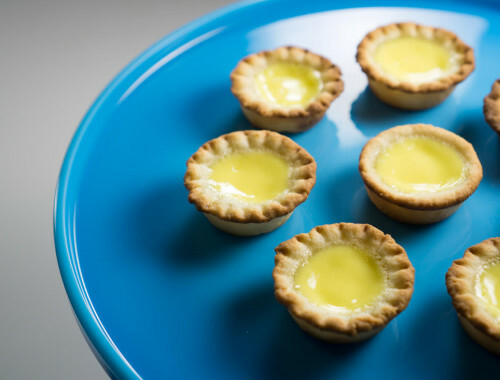 Add some lemon, if you’d like. Serve with grated Parmigiano-Reggiano. This will undoubtedly be the most expensive part of your meal. 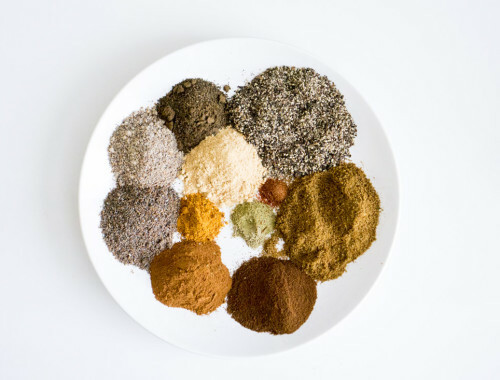 But it will add so much flavor to your dish, and a little goes a long way. Use regular Parmesan if you must. As with any hard cheese, taste as you go and add sparingly. The recipe makes enough for at least three college student-sized meals, which is as convenient today as it was in college when I would come home hungry late at night and didn’t want to eat frozen burritos. Vegetables and pasta: filling, nutritious, cheap, and a delicious spot of sunshine during the snowy and bleak days of winter. Thank you, John Thorne. A fresh-tasting, healthy, vegetarian meal to brighten up your cold winter days. Pick over and rinse the dried chickpeas. Mix with the salt and 2 cups of room-temperature water, and let soak overnight. 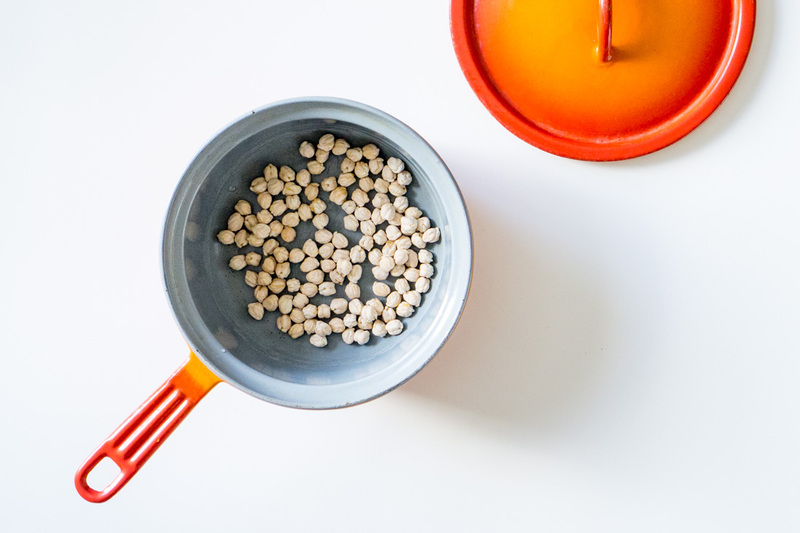 Alternatively, for the quick-soak method: bring the chickpea-salt-water mixture to a boil over high heat in a small saucepan, boil for 2 to 3 minutes, remove from heat, cover, and let sit for an hour. Two hours before preparing the meal, drain away and discard the chickpea soaking liquid. 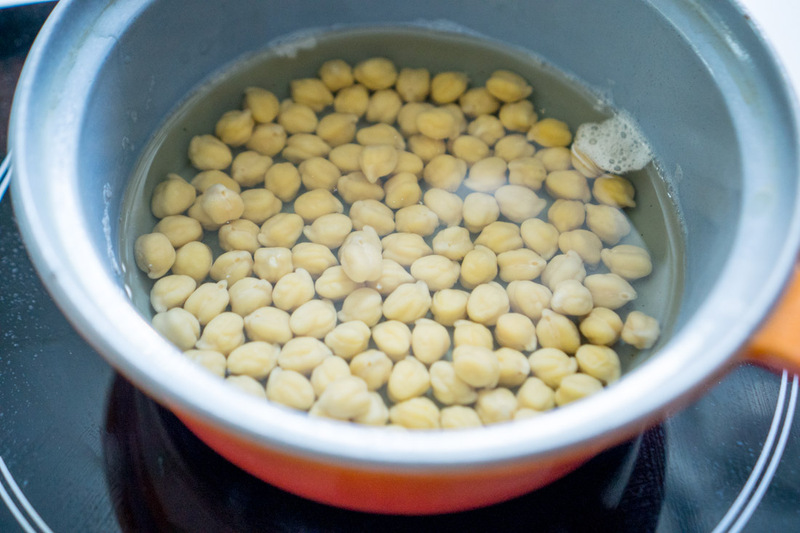 Place the chickpeas in a small pot, add 2 more cups of water, and boil, uncovered for 10 minutes. Reduce the heat to a simmer and cook until chickpeas are tender. This will take approximately 1.5 hours. Add hot water to the pot and adjust the temperature as necessary, making sure that the chickpeas are covered with water and simmering at all times. When chickpeas are done, drain, reserving both beans and cooking liquid separately. 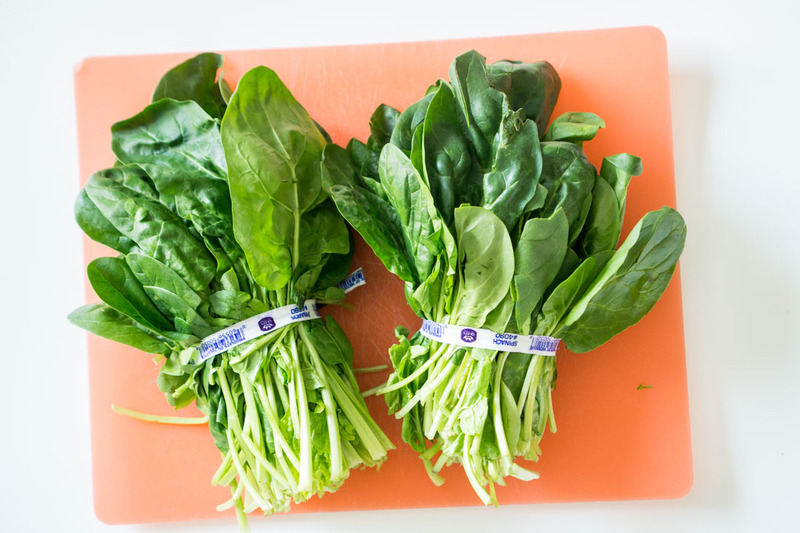 Prep the spinach carefully, discarding damaged leaves and any particularly tough stems. Wash 3 times, or until there is no more grit on the bottom of your washbowl. Put the spinach dripping wet into a large pot, cover, and wilt over high heat. Turn into a colander and press out the liquid with the back of a spatula into a bowl. 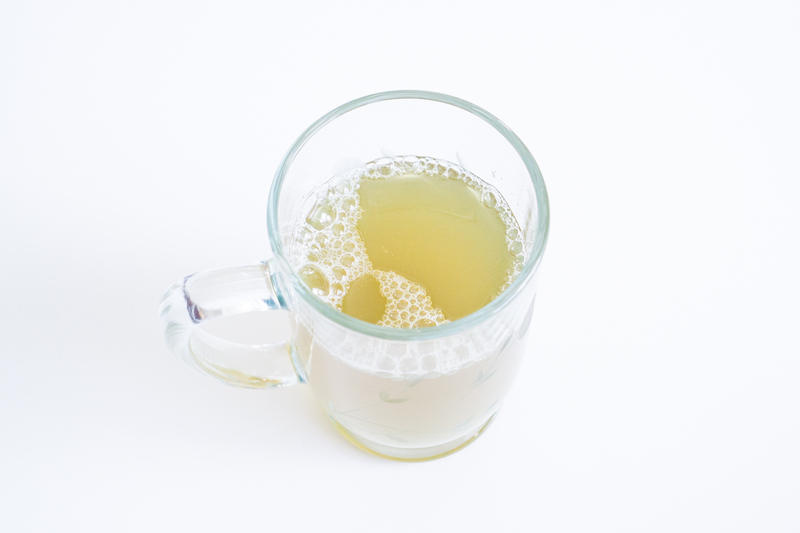 Drink this liquid--cook's treat--while preparing the rest of the meal. Coarsely chop the pressed spinach and reserve. 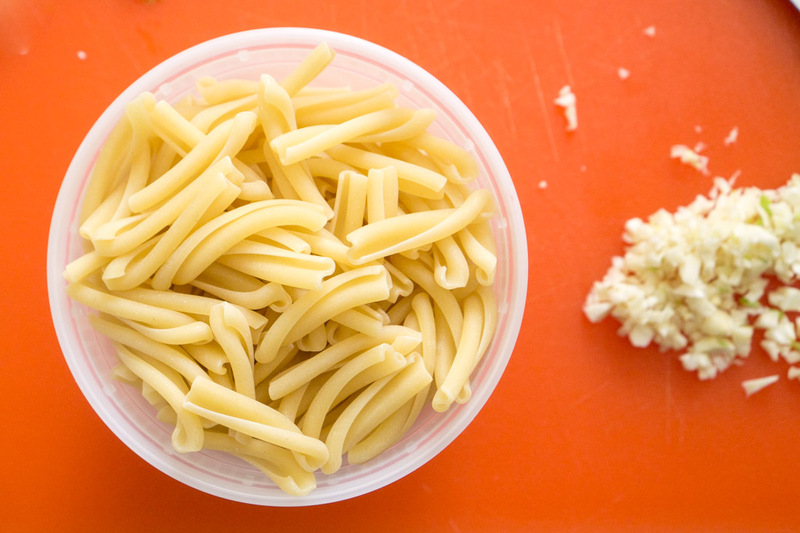 Cook the pasta in boiling salted water, stirring occasionally so it does not stick to the bottom of the pot. While the pasta cooks, heat the oil in a large skillet over a low flame. 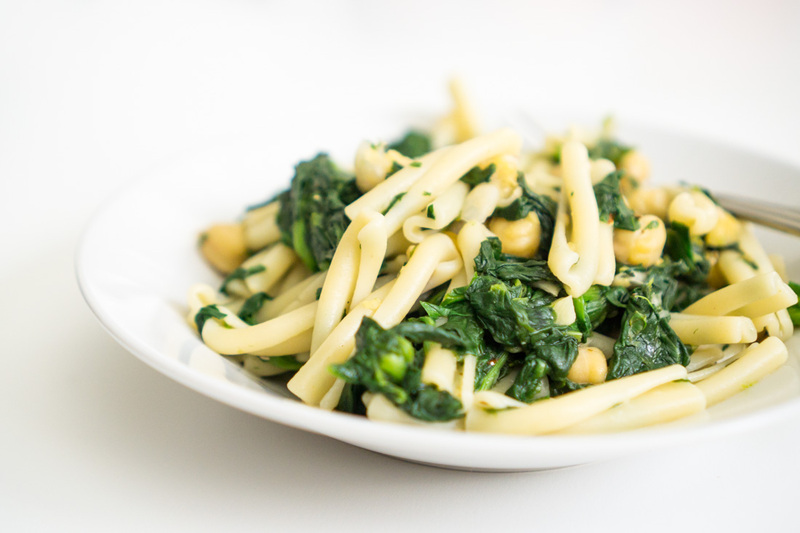 Add the red pepper flakes and minced garlic, cook for 1 minute, then stir in the chickpeas, chopped spinach, and some of the chickpea liquid to make a sauce. 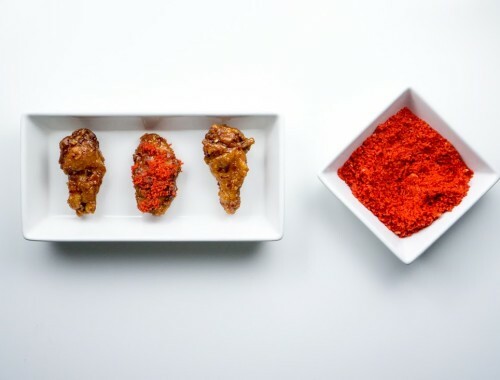 Season to taste with salt, black pepper, and lemon juice. Drain the pasta and add it to the vegetable mixture in the large skillet. Divide into large bowls and serve with grated Parmigiano-Reggiano.